At the time when, in Oxford, Robert Grosseteste constructed the first colour system since Aristotle (illustration), one of the most dazzling figures of the Middle Ages was born on Majorca. His name was Ramon Lull — Raimundus Lullus in its Latin form — (circa 1235 – 1316). He became famous through his teaching, referred to by his followers as the «Great Art», or «Ars magna». As with God and His qualities in theology, or the soul and its characteristics in psychology, Lullus had arrived at the conclusion that, in each scientific field, there are a few fundamental terms and principles which can be accepted without further explanation or additional enquiry. Accordingly, he recommended the combination of all human knowledge stemming from these elementary building blocks, and so ordered his basic terms around the edge of a circular disc. On a second smaller disc, he repeated these and additional terms and mounted both constructions to rotate, one upon the other. Through simple rotation of Lull’s wheels, new positions and combinations are always being produced which are then augmented to become statements pertaining to the different technical areas. «Truths» can be in this way be mechanically produced. Naturally, with just two discs, the system was not considered complete and many more were added, each superimposed upon the next — up to a total of 14! Any combination, regardless of complexity, could then be precisely «covered». Lull’s system represents the beginnings of a kind of modern formal logic. 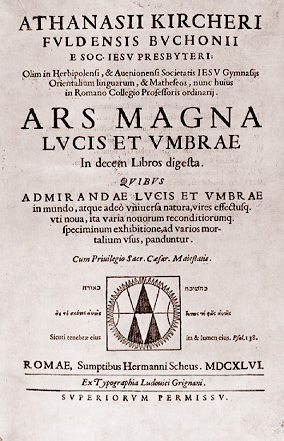 In fact, in the «Ars magna», logic has assumed the function of a universal science, the foundation of all other sciences (ars magna et ultima). One of the discs contained in the Ars brevis on which Ramos Lull based his art is dedicated to the qualities of God. (Others deal with the soul or worldly objects, the virtues, the deadly sins, knowledge and so forth.) The centre was embellished with a large letter A, with the other fields alphabetically marked from B onwards as they extend outwards. Based on the same — slightly modified — arrangement, about three hundred years later the Italian Giordano Bruno (1548-1600) reintroduced this combinatorial method in his work De lampade combinatoria lulliana (while omitting the centre A). 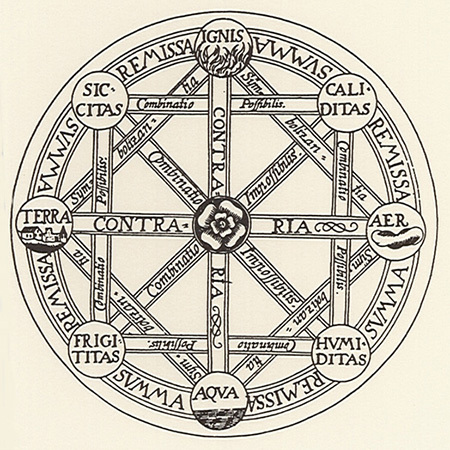 The second illustration shows this arrangement: the disc contains the divine attributes of good (bonitas), greatness (magnitudo), perseverance (aeteritas), power (potestas), wisdom (sapienta), will (voluntas), virtue (virtus), truth (veritas) and fame (gloria). 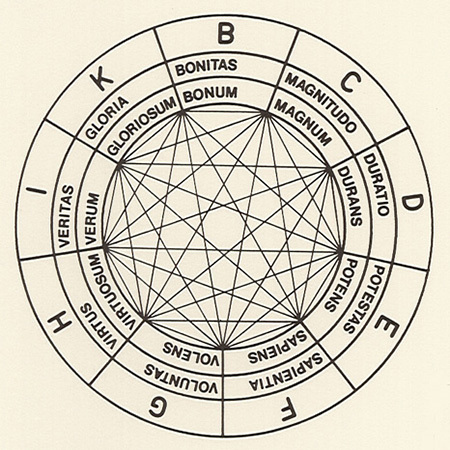 On one disc, these qualities are inscribed as substantives, and on the other as adjectives, so that when connected together a combination of terms becomes possible — a technique also employed by Giordano Bruno. As a follower of the Coptic tradition, Bruno understood the world as a complex construction in which metaphysics was quite naturally included. Indeed, while remaining committed to the metaphysical content of his work, structurally he drew upon «scientific» methods as a means of exploring this view. It was to cost him his life. In 1600, he was burned at the stake as a heretic on the Camp di Fiori, in Rome. For the philosophers, writers and scientists to come, he remained an important harbinger of modern science. Through the ages, Lull’s idea of attaining insight using formal means — a mechanical function in this case — has caused fascination in many cultures. It appears in the mysterious Jewish Cabbala, which seeks a hidden meaning for the world in the numbers and letters of ancient Hebrew. It was to first flourish in 13th century Spain, with a subsequent revival in the 16th century. The first illustration is taken from Livre de la formation by Guillaume Postel (1510 – 1581), also associated with the Ars combinatoria and thus stemming both from Lull and the Cabbala. 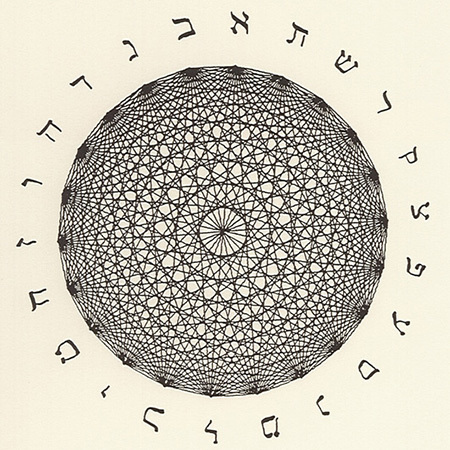 Each of the 22 letters of the Hebrew alphabet are linked to the other 21, to give 22 x 21 = 462 possible linear connections. Because each of these lines has two directions in which they can be drawn, we encounter «231 doorways». When precisely drawn, the outer circle can be seen concentrically repeated towards the centre as six smaller and less easily distinguishable circles. Despite the usual strength of a central point, for the colours it remains a hazard — only a dull grey can occur where all the lines meet, with colours appearing only on the connections running towards the edge. A diagram of the Ars combinatoria by Gottfried Wilhelm Leibniz (1646 – 1716) is reproduced to the extreme right. This system is based on the four elements (ignis – fire, aer – air, aqua – water, terra – earth), the four material states (humiditas – moisture, siccitas – dryness, frigitatas – cold, caliditas – warmth) and two possible rotational directions (remissa e summa). Of course, not all combinations are permitted — what, for example, are we supposed to imagine with dry moisture? There are three reading directions which denote the different combinations: the contradictory (terra and aer, for example), the possible (for example, siccitas and caliditas) and the impossible, (frigititas and caliditas). It is just this restriction in combinability that permits the transfer of Leibnitz’s system to colours. Here, too, there are contradictions which will not mix. How, for example, does a reddish-green or a bluish-yellow appear? This has continued to occupy us into modern times. The philosopher Ludwig Wittgenstein (1889-1951) wrote in his «Remarks Concerning Colours» (1,14): «If there would be persons to whom such expressions as «reddish green» or «yellowish blue» were genuinely natural, and who thus possessed capabilities which we lack, we would as a result not be obliged to acknowledge that they saw colours which we did not see. There is a generally accepted criterion with regard to what a colour is, namely one of our own». 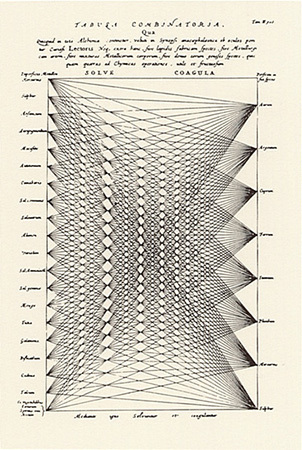 The alchemic Tabula Combinatoria by Athanasius Kircher (1602-1680), the German Jesuit, is based on another arrangement and uses other patterns. As far as colour-theory is concerned, alchemy makes the general assumption that there must be a «basic substance» contained in familiar elements. The goal of alchemists is to make this «prima materia» grow out of substances. (Here, the two factors «solution» and «coagulation» — «igne solvuntur et coagulantur» — are central to the results achieved from the combination of metals and non-metals). If, as with Robert Grosseteste, the «prima materia» and «lux» are identical, a colour-system will actually achieve this aim. Bibliography: G. Postel, «Livre de la formation», circa 1560; G. Bruno, «De lampade combinatoria lulliana», 1587; G. W. Leibniz, «Ars combinatoria», 1666; A. Kircher, «Ars magna sciendi», Amsterdam 1669.